The government has declared a portion of the Mediterranean whale corridor a marine wildlife reserve, banning future oil projects. THE WHALE corridor in the Mediterranean, which runs just North of Mallorca, has been declared a Protected Marine Area. 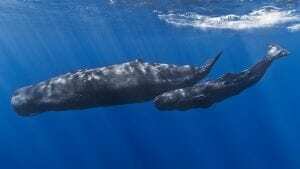 SPERM WHALES: The third largest species in the world migrate north of Mallorca. The government approved a Royal Decree protecting the waters between the Balearics, and the coasts of Alicante and Girona, running across Catalonia and Valencia. The 46,000 square kilometre section is part of an important migration route for whales and dolphins and even sea turtles. The new decree will prevent future oil projects from using the area, ending any type of hydrocarbon detecting activity. Currently there are 13 permits that have been requested, but not granted, in the area. Carlos Bravo, spokesperson for the conservation group Alianza Mar Blava, has stated that, “the ministry should immediately deny these 13 permits that have yet to be granted, as they have no rights”. Alianza Mar Blava has been a very vocal environmental group in protecting the waters around the Baleraics from hydrocarbon detection and oil drilling, and held a joint press conference with the Ministry of Environment. The aim is to “protect from the effects associated with underwater noise” the vast variety of species of whales, dolphins and sea turtles that use the area for breeding and feeding, explained the minister for the Ecological Transition, Teresa Bank. Now, nearly three percent of Spain’s waters are protected areas. Recently fin whales have been seen playing off the coast of Soller. Fin whales, sperm whales, grey whales, pilot whales and Cuvier’s beaked whales all use the corridor for migration, along with multiple types of dolphins and loggerhead turtles.